Classic label and classic bottle, this brew caught my eye about a month ago and its been shamefully sitting in my fridge for too long. Spruce beer sounds intriguing doesn't it. I know spruce is variety of conifer but I just learned fresh young spruce tips are a good source of vitamin. Captain Cook knew what he was on about when he had this brewed this up for the crew. This beer seems to be spruceless, but it does have rimu and tea tree. I wonder how the local flora compares for Vitamin C content? 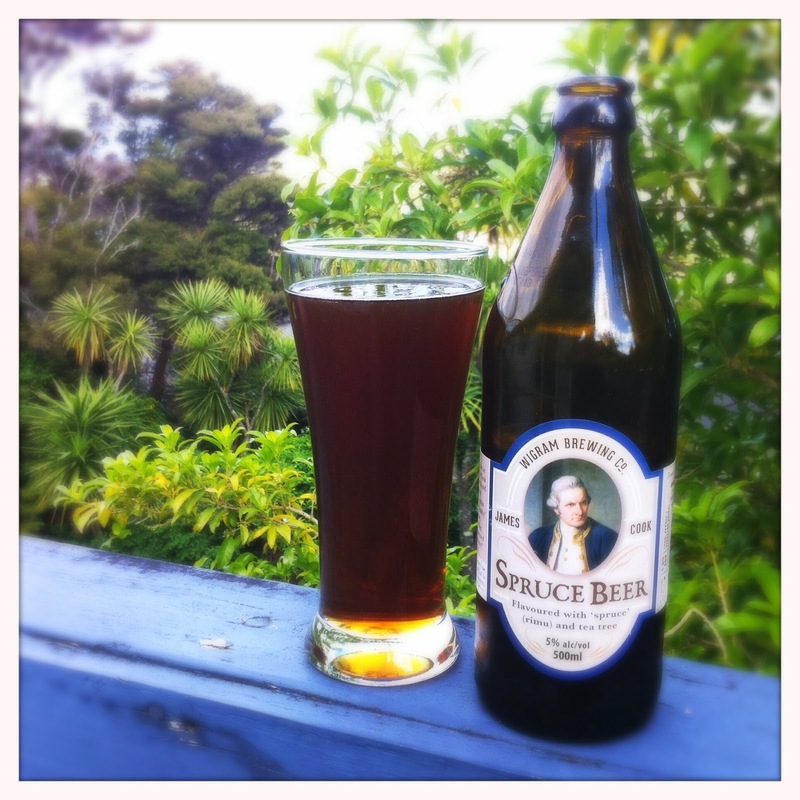 Spruce beer pours a slightly hazy darkish amber. No head to really speak of and light carbonation. The aroma is of spiced honey and homemade ginger beer. To be fair the expiry date on this bottle is 30th October 2013 so I'm only getting to appreciate it in the golden years of its lifespan. The flavour is malty and spicy, peppercorn flavours waft up the back of my throat. Its a gentle spiciness that also has ginger flavours mingling with the malts. It has a nice clean finish which suits me well otherwise I think I'd find the ginger flavour a bit too much after a while. This beer tastes old fashioned, but in a good way. Its not like any other beer I've tried. Who knew trees made good beer? However I can't imagine Captain Cooks brew tasted as good as this. Probably took a bit of skill from Wigram to get everything just balanced right. I wonder if this is the last batch I'll see or if Wigram will brew it again? I'd certainly like to taste a fresher bottle!